Moree Plains Shire Council’s Project and Development Manager Lila Fisher, left, Moree CWA Branch’s Joy Holmes, Northern Tablelands MP Adam Marshall, Moree & District Chamber of Commerce’s Nicki Drenkhan, Moree Plains Shire Councillor Stephen Ritchie and Moree Parkrun’s Annette Hadley were all smiles after the $220,000 funding announcement for more shared pathways in Moree. 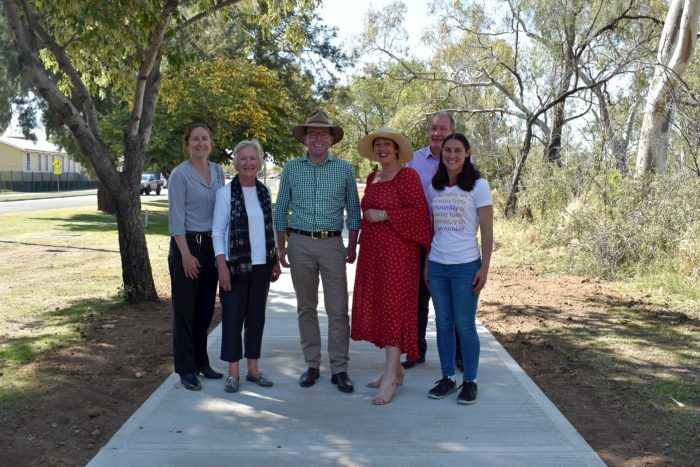 A STATE Government grant of $220,000 will stretch the shared pathway network in Moree by another 1.4 kilometres, Northern Tablelands MP Adam Marshall announced today. Mr Marshall announced the financial boost for Moree Plains Shire Council to give it monetary muscle to extend some popular walking, running and cycling tracks in and around town and create some new links for more recreational and healthy exercise. Moree Plains Shire Mayor Katrina Humphries has described the funding from Mr Marshall as “fabulous news”. It comes after a similar State Government grant of more than $402,000 announced by Mr Marshall in March this year under the first round of the Stronger Country Communities Fund for the council’s Mehi River precinct beautification project. Those works have seen a shared pedestrian and bicycle pathway extended to create a central loop from the Albert Street Bridge to Dr Geoffrey Hunter Bridge and other works along the riverside, including building new benches and picnic tables, drinking fountains and a barbecue, as well as new exercise equipment and street art. This time around the funding add-on will see the council’s Shared Pathways Project extend the existing network of two metre-wide Australian-standard pathways across the Moree town centre by an additional 1.4 kilometres. And part of the project will see a 450 metre pathway created from the Moree racecourse to the Broadwater Bridge, including some barrier separation from the road. Cr Humphries says the Shared Pathways Project had always been a great program for the town. “It gets people mobile and active, including mums and dads who can get out and push strollers around,” Cr Humphries said. “I’m pleased to see when I get around town the pathways are used a lot. The racecourse pathway into town is a great one in light of the great race meeting we have in December. Cr Humphries has welcomed the latest funding as a critical injection of government funding that benefits both locals and tourists. Mr Marshall said he was pleased to see the second round funding go towards extending the Magic Mehi vision become more reality. “The Mehi pathway works is really a great rejuvenation project, it’s creating a riverside retreat for so many more people around the town’s most recognisable natural asset,” Mr Marshall said. “It runs through the heart of town and the river is synonymous with Moree so it’s great to see the council and the community united in making it an even better asset. Moree Parkrun event organiser Annette Hadley said the funding would allow for a loop and link for their two-lap five kilometre track that means runners and other participants do the turn-around without the congestion of running back into each other. “It’s a connected and shared pathway and this will make it nicer, safer and smoother, more attractive and appealing,” Ms Hadley said. They’ve just celebrated their second anniversary in Moree, averaging about 30 to 35 participants, some with prams and strollers, each weekend, and the new link will make for more variety as well.